Release date: 15 October 2012. 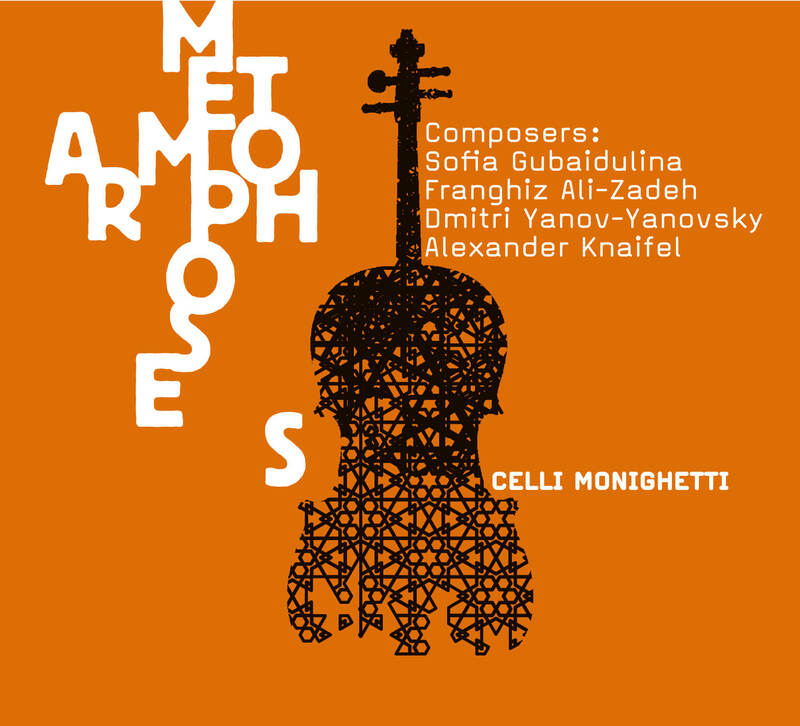 New pieces for cello octet by four composers from the former Soviet bloc – Sofia Gubaidulina, originally from the Tatar Republic, Russian Alexander Knaifel, Uzbekistani Dmitri Yanov-Yanovsky and Franghiz Ali-Zadeh from Azerbaijan – feature on a new disc by the cellist Ivan Monighetti and his group Celli Monighetti. It’s the fourth CD on the Irish label developed by Louth Contemporary Music Society, and was recorded in St Peter’s Church in Drogheda, Ireland in October 2011. The cello octet Celli Monighetti was founded by the Russian cellist in 2002 from his current and former students at Basle Academy of Music. All the members of Celli Monighetti are prizewinners of international competitions. The group has performed at international festivals such as Schleswig Holstein in Germany, Viva Cello in Switzerland, Madrid Festival in Spain, Viana de Castello festival in Portugal. Collaborating with great living composers such as Gubaidulina, Knaifel and Yanov-Yanovsky is an essential part of Celli Monighetti’s vision and an endless source of the inspiration. 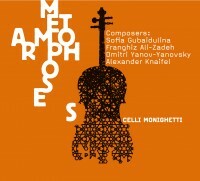 The CD takes its title from Franghiz Ali-Zadeh’s work Shyshtar Metamorphoses. However, metamorphoses also refers to one of the oldest concepts in human creativity; and all five pieces relate to that concept at varying levels and in various ways – some of them profoundly so. The concept of metamorphosis is especially congruent with the first piece on the disc, Perotin’s Viderunt Omnes for eight cellos (doubling percussion) by Dmitri Yanov-Yanovsky. 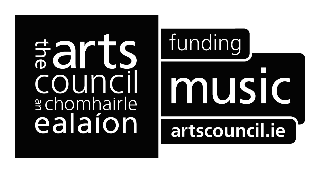 The second of his three commissions from Louth Contemporary Music Society, this 2011 work is based upon one of the best-known pieces by one of the foundational composers of Western music, Pérotin or Perotinus. Ali-Zadeh’s Shyshtar Metamorphoses (2002/03) unites elements of the traditional high-art music of Azerbaijan, Mugham, and Western compositional techniques. Variation and development are combined with a harmonic and melodic language which, to European ears, tends to sound middle-eastern. The cello version of Alexander Knaifel’s serene O Comforter (originally a 1995 choral prayer addressed to the Holy Spirit) is written for a “choir of cellos” – a direction consistent with the composer’s concept that much of his instrumental music is, in essence, vocal. why she has acquired a reputation as an innovative thinker with a profound aural imagination. The abyss of the title is the zone between the finger-board and the bridge, an area of the cello that is used in a precisely targeted way in this work. The range of material of Mirage – the starting point for the work was a dancing image of the sun viewed by the composer while walking in the fields one day – is extraordinarily diverse for a piece lasting around 13 minutes; the shimmering music seems in perpetual motion. Ivan Monighetti, born in 1944, was Mstislav Rostropovich’s last student at the Moscow Conservatory. He has collaborated with many leading contemporary composers such as Penderecki, Xenakis, Dutilleux, Schnittke, Tan Dun, Gubaidulina, Knaifel and Silvestrov. He is founding director of the Moscow Early Music festival, Professor of cello at the Basle Academy of Music, and has recorded widely (repertoire ranging from Bach and Haydn to Boris Tishchenko and Tigran Mansurian) for different labels, including Orfeo, Berlin Classics, Wergo, DUX and ECM New Series. 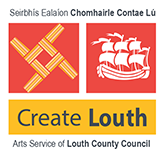 Metamorphoses follows three previous discs released by Irish concert promoters, Louth Contemporary Music Society, each extremely well-received. A Place Between (LCMS901), Path (LCMS1001) and Night Music (LCMS1201) likewise featured premiere recordings, by composers such as Sir John Tavener, Henryk Górecki, John Cage, Arvo Pärt, Alexander Knaifel, Valentin Silvestrov, Sofia Gubaidulina and Dmitri Yanov-Yanovsky.